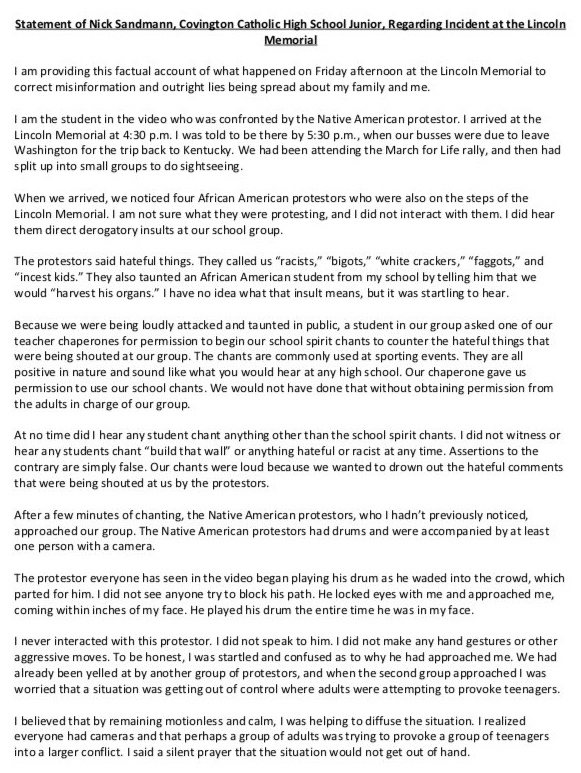 The family of Nick Sandmann released a powerful statement to the media on Sunday night telling Nick’s side of what happened on Friday at the Lincoln Memorial after the March for Life rally in Washington DC. Everything they say in this statement is 100% backed up by all the facts and evidence which has surfaced since the media and left went completely insane over an out of context 50 second video combined with unsourced, unverified and slanderous lies (all of which are fully documented and exposed here). I am not going to comment on the words or account of Mr. Phillips, as I don’t know him and would not presume to know what is in his heart or mind. Nor am I going to comment further on the other protestors, as I don’t know their hearts or minds, either.I have read that Mr. Phillips is a veteran of the United States Marines. I thank him for his service and am grateful to anyone who puts on the uniform to defend our nation. If anyone has earned the right to speak freely, it is a U.S. Marine veteran. 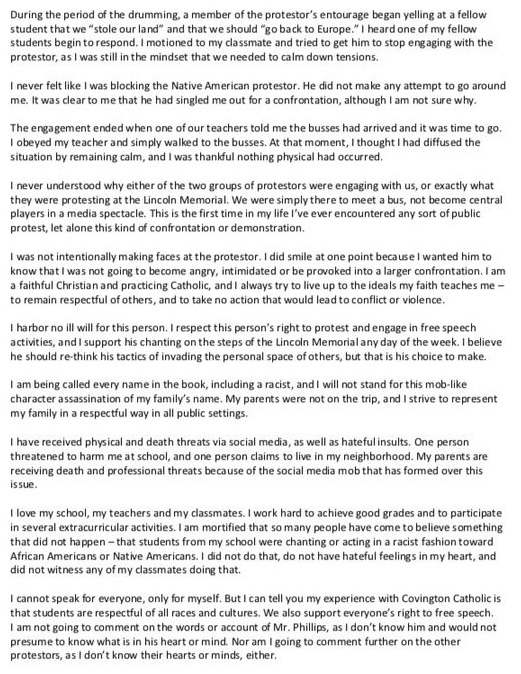 This family and all the students at Covington Catholic High School deserve extensive apologies and monetary damages from the fake news media and the lying leftist activists who tried to ruin the lives of these innocent children and slandered their good names to satisfy their sickening lust for blood.